This year a huge patch of wild blackberries has grown up just a few feet from one end of our vegetable garden. These dense bushes, which cover a radius of twenty or so feet, are almost as tall as I am and they are just loaded with huge, beautiful berries. One day last week I was picking berries from the front of the patch. My husband and sons were splitting and carrying firewood… they were all quite a distance away from me, but still near enough so we could all see each other. Then a very odd thing happened. For no apparent reason, I suddenly started feeling extremely anxious, uneasy, and apprehensive, with a strong sense that something was very wrong. All I wanted at that moment was to get out of there. I tried to ignore the feeling and continue to pick the berries, but the feeling was just too overwhelming, so I turned and started to walk away. As I did, I turned to look back towards the berries… and was just in time to see a black bear rear up on its hind legs just about a foot in front of me. It stood facing me and looking directly at me, then turned and ran in the opposite direction into our woods. 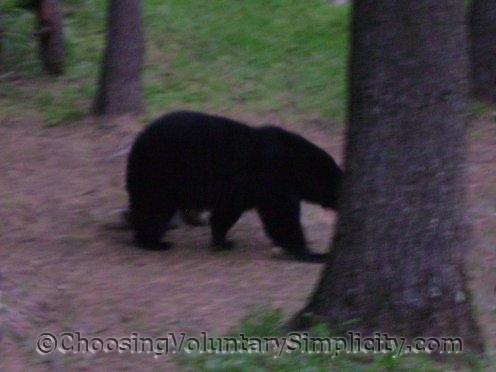 When the bear stood up, it made a guttural sound that was so loud my husband and sons looked to see what was happening, and they all saw me standing there with the bear looming up so tall and so close to me. I’ve never seen people move as fast as they did to get to me. After I regained control of my legs, :o) we all went around to the back of the blackberry bushes, and we could see two beaten-down paths that the bear had made… and a very large area in the middle where the bear obviously had been lying down. I don’t know who must have been more surprised… the bear finding itself suddenly face to face with a person or me finding myself suddenly face to face with a bear. And apparently that out-of-nowhere fear I experienced was typical… several people have told me since that it isn’t unusual for someone to feel that type of apprehension when they don’t know it, but they are being “watched” by a dangerous animal. We’re still picking blackberries almost every day, but with a difference… the very first thing we do out there is to make a thorough “bear check” through the berry patch. None of us wants a repeat of what happened last week. It is bad enough to have bears roaming around outside the house during the night, but this face to face confrontation in broad daylight was just a little too close for comfort. Are Buyer’s Clubs A Frugal Choice? Wow–that must have been scarey! You are one brave woman tho if you still go out there even after what happened. I think I would never go back there again! Love your blog and your stories. Thanks for sharing! I would still be running now….no stopping me. Wow we have no wild animals here, the worst we have is racoons. Glad you are OK.
Wow- what a great story! I know I would feel differently if it had happened to me, but I am in awe of your woman vs. nature adventure. A bear in the berry bush! Just like Blueberries for Sal! I am so glad you are ok and your story reminded me of a similar instance we had years ago in Glacier Nat’l park in MT. My family and I were hiking over by Many Glacier lodge area. It was about 6-7 ish and we were having a grand time. We met several folks coming off the path and going in for the evening. We were about maybe a mile out when I got this same type of feeling. It was a creepy feeling of impending doom. I tried to shake it off as well but it would not leave. I said to my Hubby and the girls that it was time to turn around and go back to our camp site and of course they protested but finally relented. That feeling seem to get worse as we started back and I kept hurrying everyone and making a game of catch Mom and Dad. We did get back in and off the trail and returned to our camp site for a good sleep. The next morning we heard on the local radio station that a hiker on that same trail had been mauled by a grizzly last night on the Many Glacier trail at about the same time that I had that very wierd, creepy feeling! I tell you I never will ignore those feelings if they ever come again. We counted our blessings and prayed for the hiker and friend that went thru that. I think those feelings must be our guardian angels tapping us on the shoulder and trying to get our attention. I am soooo glad you are ok. I love to read all your stories! Wow, that is really scary. Glad that everyone is OK. That “sixth sense” of danger that you felt undoubtedly kept many of our ancestors alive back when our species was prey — in the few million years before we became the dominant hunter on the planet. It is still imprinted in our genes, but we use it so seldom that we have forgotten what it signifies. Your story is a very good reminder for us modern folk. Thank you for sharing it. Actually, having such an overwhelming fear come out of nowhere scared me more than seeing the bear did! So glad you’re o.k., Ms.Shirley! Reminded me of a great kids’ book, “Blueberries for Sal.” After moving around a lot, my family settled in Owego, N.Y. which is near the Pa.border. Many people have seen black bears in that area.I have yet to see one, but my Outdoorsman father took us mtn.-climbing, camping, and skiing in the Adirondacks. We never met up with any bears, but enjoyed watching grizzlies at Yellowstone once. (Dad passed away in 2012. )In my family (I now have 3 grown sons) we are all Nature-lovers and environmentalists. One nephew is a zookeeper in Fla. ; has some great pics of him petting a purring tiger and sitting next to the giraffe who bonded with him. Your own ‘easy country life’ sounds wonderful. ENJOY! To everyone–I recommend a GREAT book entitled “The Gift of Fear”, by Gavin deBecker. All about listening to our instincts, sudden feelings of strong unease, and intuitions.He is an expert who has worked with the government and helped develop safety plans r/t terrorists, stalkers, etc.This book literally helped me save my own life twice! You are all correct about paying attention to our ‘gut feelings’ and intuitions.Even when we are totally relaxed/tuned out to our surroundings, a so-called primitive part of our brain is ON ALERT for our safety and will ‘get louder’ until it has our attention!